RTÉ HAS, IN its own words, lined up some “Christmas crackers” for the festive period with programmes it hopes will suit everyone over the holidays. Entertainment will come in the form of a Christmas special of Brendan O’Carroll’s Mrs Brown’s Boys along with the start of a new series of the hit programme. There is also a new series of Sgt Mattie starring D’Unbelievable Pat Shortt. Also in the mix are Christmas specials of homegrown favourites Wagon’s Den and Republic of Telly as part of a wide-ranging schedule over the December and January period. If you’re a Jedward fan you will be happy to know that they will making dreams come true for children from all over Ireland on their first ever Irish television series OMG! 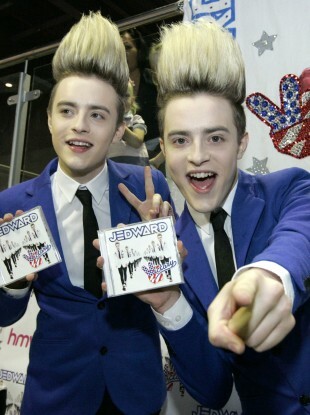 Jedward’s Dream Factory. There is sure to be drama in Fair City over the Christmas period as we wonder whether Bob’s plans for romance with Rebecca materialise. We can also reveal that a fugitive will return to Carrigstown – but who is he and will he get caught out? Music-wise The Dubliners will join Gay Byrne for For One Night Only while viewers can also look forward to celebrating Daniel O’Donnell’s 50th birthday in Daniel at 50. For those interested in current affairs Now That’s What You Called News will reveal the top 20 biggest, most interesting, colourful and bizarre news stories we explored online over the past twelve months. While, The Queen’s Speech will tell the inside story behind the planning of the visit of Queen Elizabeth II to Ireland in May. Also on the agenda is The RTÉ News Review of the Year where Bryan Dobson will look back at what has been an extraordinary year in Ireland and the world. Des Bishop’s Best Bits compiles the comedians favourite bits from three of his DVD releases. Derek Mooney celebrates Christmas with Mooney Tunes, a unique collaboration between RTÉ Radio 1’s Mooney radio show, the RTÉ concert orchestra and the entire radio audience. Miriam O’Callaghan will host the New Year’s Eve Show Live, featuring some of the best of Irish talent. Winning Streak will provide lots of Christmas cheer with two programmes over the festive period. The Savage Eye dishes up a Christmas episode called ‘Why do the Irish Love Christmas? The Saturday Night Show will feature special guests from the X Factor and The Only Way Is Essex. Ryan Tubridy presents a festive Christmas edition of The Late Late Show. For you foodies Donal Skehan is back with a Kitchen Hero Christmas Special and Rachel Allen presents her guide to stress-free festive food in Rachel Allen’s Easy Meals. For the movie fans there’s plenty of festive films including Quantum of Solace, Harry Potter and The Half-Blood Prince, romantic comedy The Proposal, Transformers: Revenge of the Fallen, 2012, Bruno, Michael Jackson: This is It, Bolt, animated classic Monsters and Aliens and Waveriders. For sports fans there’s a a chance to relive Kilkenny v Tipperary – The Trilogy as some of the key players from both hurling counties give their thoughts on three compelling matches that gripped the nation. While Ireland’s Road to Euro 2012 will relive the crucial moments in the Republic of Ireland’s successful European Championships qualification campaign. Email “RTÉ lines up Christmas specials of... Mrs Brown's Boys, Wagon's Den and Jedward”. Feedback on “RTÉ lines up Christmas specials of... Mrs Brown's Boys, Wagon's Den and Jedward”.